Atletico Madrid kept their La Liga title hopes alive with victory over Gary Neville's Valencia. Former Liverpool and Chelsea striker Fernando Torres scored the pivotal goal on 72 minutes as Atletico moved within eight points of leaders Barcelona. Antoine Griezmann put Atletico ahead and Denis Cheryshev equalised for Valencia before Torres struck. Valencia had Anderlan Santos sent off on 80 minutes before Yannick Carrasco completed the scoring. Neville suffered just a second defeat in seven games as goalkeeper Diego Alves endured a tough night. Atletico made the brighter start so it was no real surprise when they went ahead in the 24th minute. They squandered possession 25 yards from goal and Griezmann let fly with a low shot that crept inside the near post with home goalkeeper Alves slow to react. The lead lasted just four minutes, however, before Valencia scored as a long pass was cushioned by the head of Paco Alcacer to Cheryshev, who lashed home a left-footed drive from 15 yards. Cheryshev lifted a shot over the crossbar from another Alcacer header seven minutes before half-time as Valencia grew in confidence. Alcacer had a chance to put Valencia ahead just before the hour mark when he latched onto a pass by Sofiane Feghouli but fired straight at goalkeeper Jan Oblak. Moments later Alves made up for his earlier error with a fantastic, one-handed save to keep out a powerful effort by Luciano Vietto. But the keeper could do nothing to stop substitute Torres, who was making his 300th Atletico appearance, putting his side ahead with 18 minutes remaining as he slid in at the far post to turn the ball home after Jose Maria Gimenez flicked on a corner. Santos saw red for two bookable offences with five minutes remaining and Carrasco made it 3-1 five minutes later when he fired straight at Alves, who allowed the ball to creep in under his legs. Earlier in the day, Barcelona kept up their run with a comfortable win at Eibar. Match ends, Valencia 1, Atlético de Madrid 3. Second Half ends, Valencia 1, Atlético de Madrid 3. Attempt missed. Yannick Carrasco (Atlético de Madrid) right footed shot from the centre of the box is close, but misses to the left. Assisted by Juanfran with a cross. Substitution, Atlético de Madrid. Óliver Torres replaces Antoine Griezmann. Offside, Atlético de Madrid. Yannick Carrasco tries a through ball, but Juanfran is caught offside. Goal! Valencia 1, Atlético de Madrid 3. Yannick Carrasco (Atlético de Madrid) left footed shot from the right side of the box to the centre of the goal. Assisted by Antoine Griezmann. Substitution, Valencia. Álvaro Negredo replaces Javi Fuego. Offside, Atlético de Madrid. Antoine Griezmann tries a through ball, but Juanfran is caught offside. Corner, Atlético de Madrid. Conceded by Shkodran Mustafi. Second yellow card to Aderlan Santos (Valencia) for a bad foul. Foul by Aderlan Santos (Valencia). Sofiane Feghouli (Valencia) is shown the yellow card for a bad foul. Foul by Sofiane Feghouli (Valencia). Attempt missed. Yannick Carrasco (Atlético de Madrid) right footed shot from outside the box is close, but misses to the right. Assisted by Fernando Torres with a headed pass. Attempt missed. Danilo (Valencia) right footed shot from outside the box misses to the right. Assisted by Sofiane Feghouli. Corner, Valencia. Conceded by Lucas Hernández. Goal! Valencia 1, Atlético de Madrid 2. 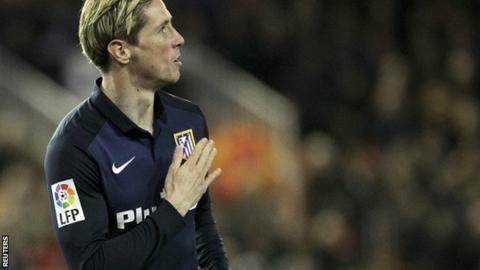 Fernando Torres (Atlético de Madrid) right footed shot from the left side of the six yard box to the bottom left corner. Assisted by Giménez with a headed pass following a corner. Attempt missed. Saúl Ñíguez (Atlético de Madrid) header from the centre of the box misses to the right. Assisted by Filipe Luis with a cross. Substitution, Atlético de Madrid. Yannick Carrasco replaces Luciano Vietto. Attempt blocked. Sofiane Feghouli (Valencia) left footed shot from the right side of the box is blocked. Assisted by João Cancelo. Hand ball by André Gomes (Valencia). Luciano Vietto (Atlético de Madrid) is shown the yellow card for a bad foul. Corner, Atlético de Madrid. Conceded by Sofiane Feghouli.